It was around 5pm. We had been up and walking since 7am from Atiwhakatu Hut down in the river valley. Now you may wonder how much distance and ascent we have covered in this solid 10 hours in our life, the answer is I don’t know, but for the condition of that day and honestly our abilities, too much. The sun was staring at us three tiny human-beings from above with intense curiosity. While we were stopping on the ridge before the next ascending movement, trying to motivate our muscles and more importantly our mind, I felt a flux of emotion as if water was surging from a newly-dug spring. Every piece of my muscle fibre was protesting, but my brain obliviously turned its thought away, muting the pain signals. The corners of my mouth shifted upwards. My eyes gazed once again towards the direction of where we were heading, this time with a fresh feeling of happiness. It is a strange thing, how at such challenging moments happiness can just creep in like that. Perhaps my physical body had discovered its limits, and from the low-key dehydration/heat stroke and increasing discomfort in my knees, my mind connected to my body in a never-seen-before level. This mindful moment drove all my mental chatter away. It was like a hut suddenly lit up in the middle of nowhere after hours and hours of night tramping. Such a powerful moment that you want the world to stop right there, and just be with it. So I claimed aloud: “I feel happy NOW.” Tom and Mats both stopped moaning and looked at me as if I came from another planet. “What? Are you enjoying it now?” “YES!” with the biggest smile was my declaration. At the same time I realised I have long forgot to appreciate the beauty of these mountains in our surrounding. 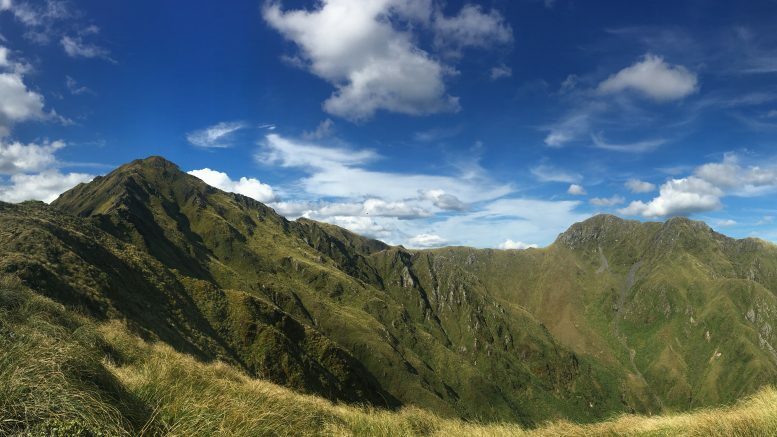 We were at the foot of Girdlestone, after traversing half a dozen of 1,500m peaks along what felt like the most remote Tararua ridges. This one would be the last barrier between us and Tarn Ridge Hut, where our feet can finally say see-ya-later to smelly boots. The following day we would be backtracking a wee bit from the hut then tackle Mitre of 1,571m, the highest peak in the Tararuas. But back to the start. 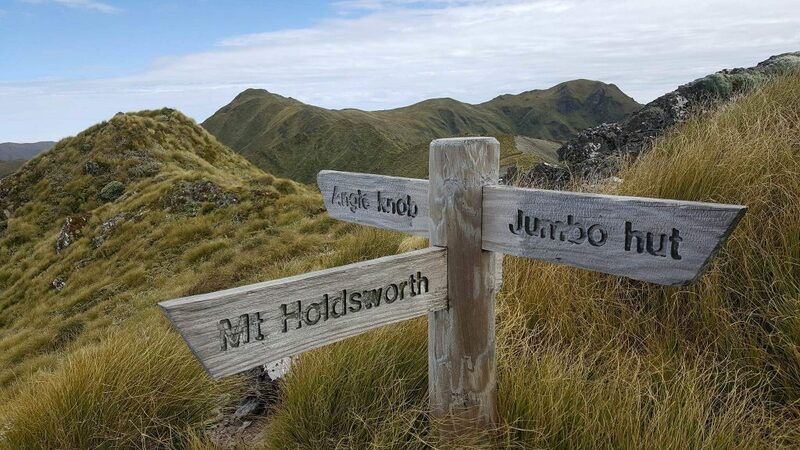 Holdsworth carpark is a popular entry point to the Tararua ranges from the east side. We reached there on a Friday night in December, then walked quickly (1’20”) through the forest for 7km to reach Atiwhakatu Hut. We were pretty lucky to have a whole room to ourselves (the spacious hut is separated into three rooms). After cooking up a warm soup and lying on the river rocks silently with only stars and wind, we tip-toed back to our home for the night with help from the moon light, curled up next to each other and wished for a good next day. We woke up early with the sound of wind howling out the window. It was a bit worrying as we were anticipating a whole day of open-top ridge walking which I wouldn’t recommend in bad weather condition. 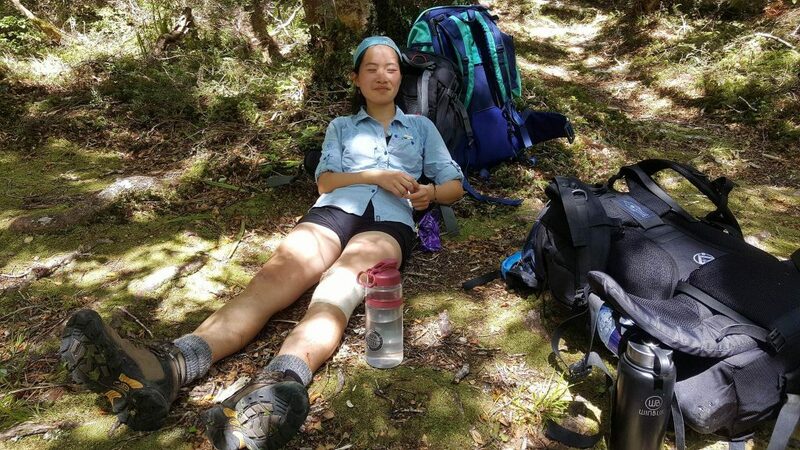 A month before, when we tried southern crossing of Tararuas, I nearly got blown off the track – if you are light in weight, carry some big rocks or hold on to your mates for dear life!!! But somehow rain and wind always sound more intimidating when you are inside a shelter. It turned out to be the opposite weather of what we feared. This was the highlight of the day! I could still picture our team of three giving this piece of track our best focus, choosing each foothold and handle carefully and proceeding steadily. The gentle excitement from risky behaviours was swelling inside me with each up-and-down completed. For many sections where ridge top was impassable, we had to engage four limbs. I’ve never done rock climbing but it reminded me of blue sheep hopping on narrow tracks in Tibet. Now I could understand our kind driver’s words: don’t come if you are scared of heights!! On the map the pinnacle section is no more than 2km in distance. However it was around lunchtime, and the strong sun was directly above us. It felt like forever until we got to a very tricky descent. I remember there was a metal knob embedded in a rock on the way down, for roping people or backpacks downwards. We didn’t have any ropes with us, so I tried to descend facing forwards – my backpack was in the way; or backwards – my feet couldn’t reach any stable piece of rock. Very awkwardly I decided to throw my pack down, and with that decision the next 60s I stared at it tumbling down the slope, with an odd sense of relief – no worries! After we all landed safely, I fetched my pack and climbed back up the leatherwoods. We were so exhausted from the concentration and heat that we decided to nap right there. Mats pointing at where we came from – where’s the track? The 20min nap was energising, but it didn’t help with what waited ahead. Somehow all the clouds went on holiday and our chocolate melted into drinks. Next came the Three Kings, each king was a steady climb up then down. I felt grateful there weren’t more kings in the world. We had actually covered a fair distance judging from the map, but we were only half way til our shelter for the night, and our water level was running low. The rest of the afternoon consisted of numerous small rests as we dragged ourselves along the ridges towards Girdlestone. 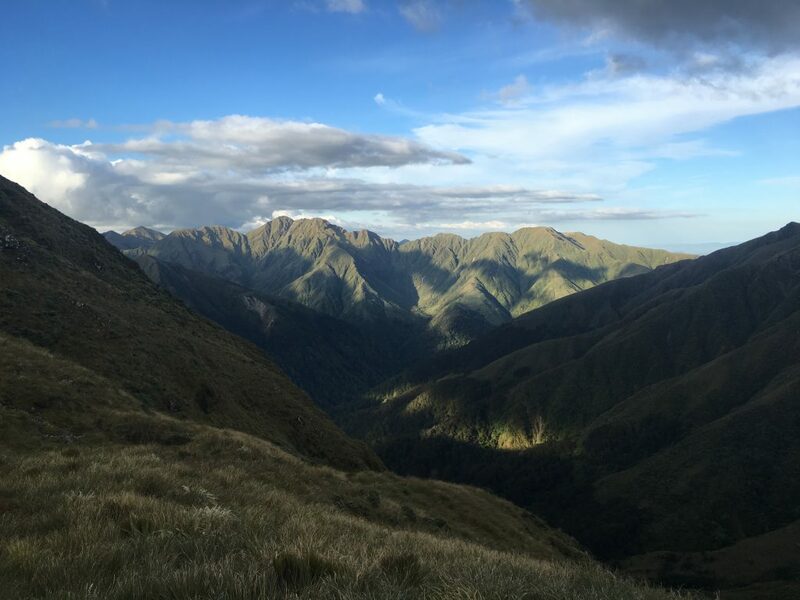 We met a happy man around Adkin with a tiny day pack and two hiking poles – he was challenging all the 1,500m peaks and started his day from Mount Bruce. The next day we ran into two of his mates and heard that he finished his tramp at 2am at night, a bit more than 24hrs as he planned. So when we finally gathered enough strength to tackle our last ascent of the day, I was blessed with my new found happiness. We napped for half an hour on top of Girdlestone — I guess our napping ability was increased from having dry mouth most of the afternoon. Only water source of the day was at Jumbo Hut from the rain water tanks. The huge amount of sweat we had because of the heat meant dehydration was a real risk, and we were glad to be on the way down to Tarn Ridge/Water-is-so-good Hut. However when we saw a leaky tap there it was surely alarming — if weather continued like this with no rain for a few days, I didn’t want to imagine if someone came this far like us, only to find an empty water source. We topped up our water bottles, cooked Uncle Ben rice for dinner and quickly jumped into our sleeping bags, before 8pm while it was still bright outside. That was the only time I couldn’t care about a sunset in the mountains! It hasn’t finished yet. But we were faithful as the heat started to fade. 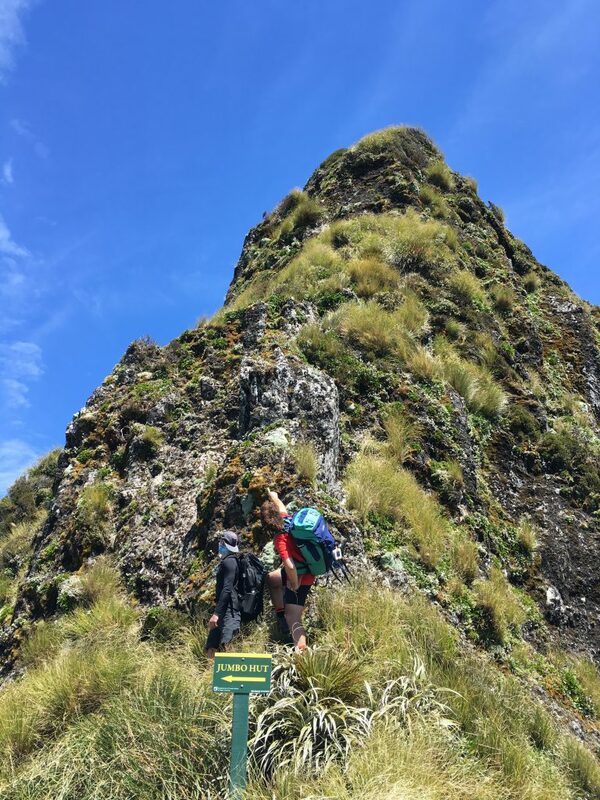 Not long after, we saw a sign pointing to Jumbo, and that stirred great joy among our team — the climb to Jumbo was only a couple minutes away from Atiwhakatu Hut where we stayed the first night! 10min passed, then 30min passed along the river, and we became increasingly confused as if we were walking the bush in darkness like Friday night. Later we realised that was another ascending track, quite a way from where we started climbing up. When finally we saw Atiwhakatu Hut again, we were exhausted to say the least. Mats and Tom jumped into the river while I watched our afternoon tea cooking – another Uncle Ben rice. If you don’t mind the weight and the rubbish, it’s a convenient camping food, the pre-cooked flavoured meal only takes 2 minutes to warm up. We had to push on as Mats and I were catching a 7pm train back to Welly to start work the next morning. Buddha knows how we managed the last 7km in less than the time we spent when we came on Friday night. When finally we made it to the car park, we met a guy with doggies who could speak perfect mandarin and said he was from Northeast China. Clearly he went for a leisurely day walk, while Tom was almost going to boast to him “Did you summit 12 summits over the weekend?” But we were on a mission to catch the train so farewell to this white Chinese guy. On the drive back to Masterton, I checked my phone only to find that we had got the wrong timetable, no more trains on Sundays! Relieved just like when my pack dived downhill, we drove straight to the supermarket and bought a 12-pack Heinekens, together with the cheap-but-divine Domino pizzas. Not sure whether it was allowed to drink in public in this city, we took our trophies to the local park nonetheless, as Tom was prepared to debate any policemen with our summiting history over the past 48hrs. To this day, t’was still the best pizza-beer combo in all three of our memories. For a while I felt guilty for how privileged I am, but later I figured it's not about “me”, it’s about how to help the world with all the resources you’ve got. And luckily most good things in life are free: water, oxygen, mountains and friendships. Going bush reminds you how little you need just to be happy. 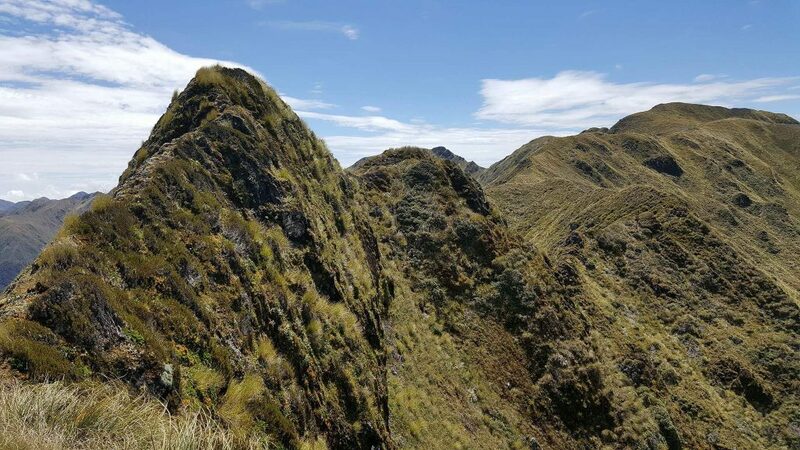 Be the first to comment on "Off Track in New Zealand: Jumbo, Broken Axe Pinnacles and Mitre in the Tararua Range"